Field a Zombie character die in your Used Pile at level 2. 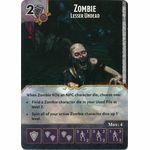 Spin all of your active Zombie character Dice up 1 level. When Zombie successfully regnerates during the Attack Step, Prep any Zombie character dice in your Used Pile. 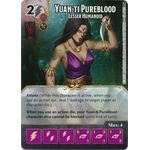 When you use an action die, your Yuan-ti Pureblood character dice cannot be blocked (until end of turn). Attune (While this character is active, when you use an action die, deal 1 damage to target player or character die.) 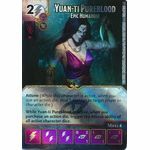 Yuan-ti Pureblood cannot be targeted by action dice or Global Abilities. 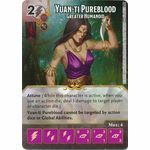 While Yuan-ti Pureblood is active, when you purchase an action die, trigger the Attune ability of all active character dice.